is a Native multimedia artist from the Chippewas of the Thames First Nation (Deshkaan Ziibing Anishinaabeg) located twenty minutes south west of London, Ontario on the north bank of the Thames River. 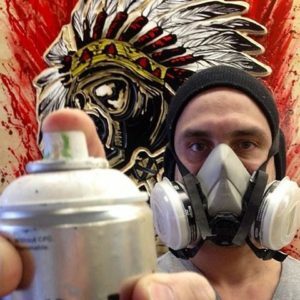 Jay creates art under the name Chippewar which represents the hostile relationship that Canada’s native people’s have with the government of the land they have resided in since their creation. Chippewar is also a reminder of the importance of the traditional warrior role that exists in Indigenous cultures across North America that survives into the present day. Question #1 : What are some of the messages in your art?